"We are all different, and many of us are strange. But we are colleagues, even if we are competitors. My fellow booksellers are generous with their time and their knowledge. They don't hesitate to lend a hand to a fellow bookseller. They constantly try to make the tent larger so more of us, and those who are different than we are, can not only fit but thrive. The knowledge sharing, the Spanish-language book drive to send books to people at the border, the numerous seminars on ways to facilitate conversations across society's various divides found at Winter Institute make me proud to be a part of this profession." In the fourth quarter ended December 31, net sales at Amazon.com rose 19.7%, to $72.4 billion, and net income rose 63.1%, to $3 billion. For the full year, net sales rose 30.9%, to $232.9 billion, and net income rose 232.1%, to $10.1 billion. The quarterly sales and earnings figures were both higher than analysts' estimates and records for the company, but because of concerns about the rate of growth, Amazon stock fell about 4%, to around $1,650 a share, in pre-market trading this morning. The fourth quarter revenue gain of 19.7% was the lowest since 2015, and the company's rate of growth during 2018 declined. Also Amazon predicts that first-quarter revenues this year will grow "only" 10%-18%, or between $56 billion-$60 billion, a range that is below estimates. There were also concerns about regulatory actions by the government in India, where Amazon is seeking to expand operations, as well as rising warehousing and distribution costs, reflecting the company's continued opening of new warehouses and rising minimum wages. As is usual in recent years, in its long press release announcing quarterly results, Amazon barely mentioned books. Yesterday, the only mention was this: "In 2018, authors earned more than $260 million from the Kindle Direct Publishing Select Global Fund, totaling more than $840 million since the launch of Kindle Unlimited. Hundreds of thousands of authors have self-published millions of books through KDP since launching the service in 2007. Additionally, thousands of independent authors earned more than $50,000, with more than a thousand surpassing $100,000 in royalties in 2018 through KDP." Amazon's advertising and cloud business, AWS, had the highest growth rates in the company. In the fourth quarter, third-party vendors accounted for slightly over half of unit sales on Amazon.com. BookExpo has announced UnBound, a sidelines-focused "show within a show" that will premiere at BookExpo May 29-31. UnBound will feature a range of non-book products across 25 categories, including greeting cards, stationery and journals, as well as desk accessories, candles, science and nature products, toys and games, art supplies, and artisanal and handmade items. Booksellers will have a chance to view products, talk to manufacturers and suppliers and see some live demos. Attending UnBound comes with no additional costs or separate entrance requirements, and booksellers will be able to move freely from one show to another. UnBound will also be open during BookCon on June 1-2, when it will transition to a more consumer-facing event with events and product demos. "We hope to bring in a new audience of stores that may have a curiosity about BookExpo but didn't really see it as something for them," said event director Patti Stracher-Lee, who was v-p and show director of the National Stationery Show for 25 years. "We know that there is a growing need for booksellers to build their sidelines business, and while there are shows out there for them to do that, that means another trip, another bunch of days out of the office." "As a time-starved bookseller, it is always nice to be exposed to new vendors at locations I'm already visiting," said Chris Morrow, owner of Northshire Bookstore in Manchester Center, Vt., and Saratoga Springs, N.Y. "Sidelines make up an ever-growing segment of our business, and it will be great to see these vendors at BookExpo." The Coretta Scott King/John Steptoe New Talent Awards "affirm new talent and offer visibility to excellence in writing or illustration at the beginning of a career as a published book creator." Last week at ALA Midwinter in Seattle, Wash., the winners of the CSK/John Steptoe New Talent Author and New Talent Illustrator were announced: Tiffany D. Jackson for Monday's Not Coming (Katherine Tegen/HarperCollins) and Oge Mora for Thank You, Omu! (Little, Brown). 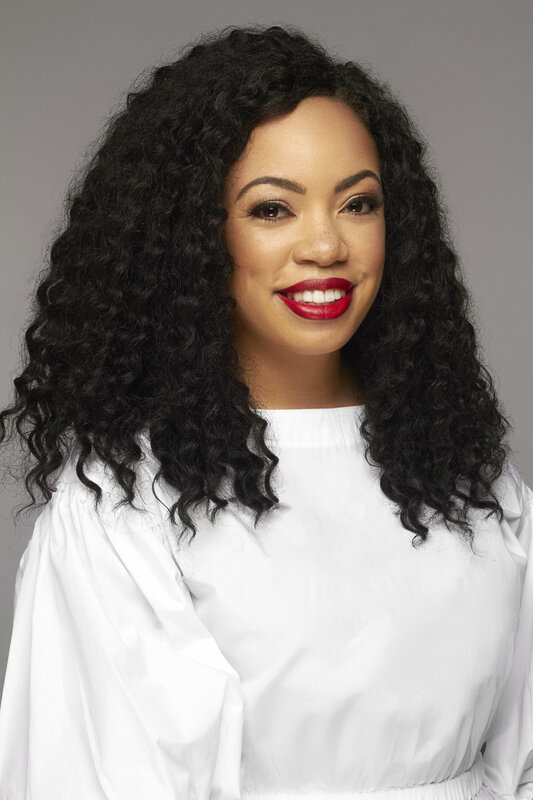 Tiffany D. Jackson is the author of critically acclaimed YA novels including the NAACP Image Award-nominated Allegedly, the Walter Dean Myers Honoree Monday's Not Coming and the forthcoming Let Me Hear a Rhyme. I'm still in shock! Funny story: I had no idea the awards were happening. I had just flown back from Paris the night before and was a bit out of it. That's why when I got the call, I almost didn't answer the phone, thinking it was an insurance telemarketer. But when I did, I sounded like a disgruntled Granny. "What are you talking about? What awards?" This clueless moment will have to go into my memoir. As your website says, you are a "TV professional by day" and a "novelist by night." Monday's Not Coming is your second book; what has it been like to receive such acclaim for your "night" work? It's overwhelming. I've recently pulled back from my freelance life to transition into a full-time author. Most of my TV peeps are still in awe that I'm an author now since no one knew I was working on a book. I kept that part of me secret so the success is somewhat blindsiding. But everyone is thrilled. The love is real. Do you pull a lot from your film and TV experience to create the dramatic, well-paced works you've given us so far? Do you think that is part of what makes your books stand out? Absolutely! Films and books are nothing but storytelling told through different mediums. Being a filmmaker by trade, my books tend to follow a three-act script structure and character arc. As for pacing, there's this rule in film that one page of a script equals one minute of screen time. You have to make every moment count to move the story forward (for time and budget purposes). I apply that same theory to books. Every scene has to be meaningful and cinematic, if not, it'll land on the cutting-room floor. What is it you hope readers take with them from their time with Monday's Not Coming? My hope is that Monday makes readers ask themselves the most fundamental questions of the book: How do black girls just go missing? Why aren't they receiving the attention they absolutely deserve when they do? And how can I be a part of changing this narrative? I am! Two projects, actually. Even though I have more time to write than ever before, it's almost harder. Currently trying to return to my roots and re-join the 5 a.m. writers club. I was way more productive back then. Thank you so much for talking to Shelf! Is there anything else you'd like to tell our readers? Thank you so much! I really was hard on myself about this book. I thought it was trash and the feedback would be scathing. To see it shine like this, I'm speechless and immensely grateful. Oge Mora is an author/illustrator and painter. Thank You, Omu! is her debut work for children. Two awards in one day: a Caldecott honor and the CSK/John Steptoe Illustrator Award. That's very exciting! How are you feeling? Definitely overwhelmed, but so incredibly happy. I was busy in the studio when I got the first call from the Caldecott committee. When the Coretta Scott King committee called later, I was just floored. What a wild magical day. Everything has been a bit of a whirlwind since. 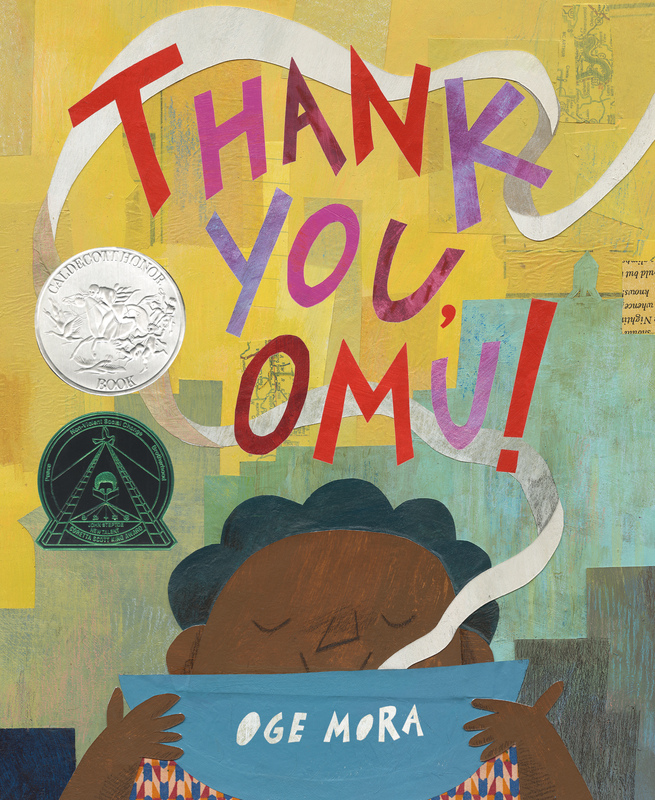 Omu has received quite a bit of acclaim already, including a bunch of starred reviews, showing up on a number of Best Books lists and now a Caldecott Honor and the CSK/John Steptoe. How has it felt to see your first work get so much love? It has been amazing to see people truly get behind Omu, especially since I'm so new to publishing. People have told their friends and brought it to their classes and booksellers put it on shelves. Seeing it on lists and in the newspaper has been an incredible experience. As an artist/writer you really want your work to connect with people, so watching that happen has been my greatest joy. I didn't think I could be happier... but here I am! How does it feel now to see it be honored in this way? Extraordinary. There were so many amazing books this year, as there are every year. I am humbled to have my book recognized. I'm inspired to continue to make sure I am trying to put out the best work I can. Your Twitter says you're busy planning new projects. Anything you can tell us about? Yes! My next written/illustrated book is already underway with Little, Brown and it is called Saturday. I am also illustrating The Oldest Student by Rita Lorraine Hubbard for Schwartz and Wade and Everybody in the Red Brick Building by Anne Wynter for Balzer + Bray. I'm neck-deep in paper scraps and paint! Woohoo! All I can say is that I truly appreciate all the love that has been sent my way since my book first debuted in October. Thank you! The Book Industry Charitable Foundation's "Heads or Tails" fundraising game at this year's ABA Winter Institute in Albuquerque, N.Mex., raised more than $7,500. Bookselling This Week reported that Whitney Balaun, the business development specialist with LIBRIS who won the grand prize, a $500 American Express gift card, "was playing as a proxy for a bookseller: Deon Stonehouse, who co-owns Sunriver Books & Music in Sunriver, Ore., with her husband, Rich. Stonehouse donated her winnings, in full, back to Binc, increasing the total raised from $7,059 in pin sales to $7,559 overall." "Because the ABA so generously underwrote the cost of Heads or Tails again this year, all proceeds will benefit booksellers," said Binc executive director Pamela French. "We would like to thank each bookseller, publisher, author, and Wi14 attendee who played the game with us. The generosity of our shared community will help four booksellers and their families get through a financial crisis." At the Wi14 Indies Introduce Authors & Booksellers event, 14 of the 20 debut authors in the Winter/Spring 2019 Indies Introduce program were featured. Each writer read a brief passage from their book and then fielded a question from one of the panelists. 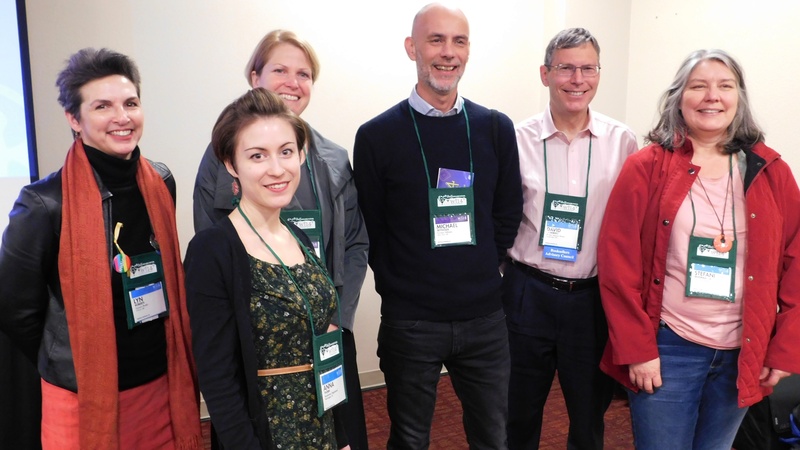 ABA senior program officer Joy Dallanegra-Sanger noted that during the six years the program has been in existence, panelists "have made a huge difference in a bunch of authors' lives. It's been really exciting. So far over 245 booksellers have read for Indies Introduce, which is amazing. And I'm always looking for readers, so if you ever want to read please send me a note to joy@bookweb.org and I will absolutely get back to you and put you on my list of potential panelists." Middle Grade/YA Debut panel chair Cathy Berner of Blue Willow Bookshop in Houston, Tex., said, "I want to echo Joy's suggestion that if you want to read, excuse my language, a crap-ton of books over a short, compressed period of time and make really good friends I highly encourage that you do this. I have eight new friends and those conversations were a labor of love and the depth and thought that they provided to those discussions was invaluable to me as a bookseller." She then introduced members of her team in attendance at Wi14: Nichole Cousins of White Birch Books, North Conway, N.H.; Adah Fitzgerald of Main Street Books, Davidson, N.C.; Christy McDanold of Secret Garden Bookshop, Seattle, Wash.; and Javier Ramirez of the Book Table, Oak Park, Ill. Also on the panel were Katherine Warde of Micawber's Books, St. Paul, Minn.; Alicia Michielli of Talking Leaves Books, Buffalo, N.Y.; Heather Smith of Linden Tree Children's Books, Los Altos, Calif.; and Jen Pino of Vroman's Bookstore, Pasadena, Calif.
Before introducing the Adult Debut panel, chair Sarah Bagby of Watermark Books, Wichita, Kan., said, "I want to also thank all the publishers who brought their authors here because it's really fun to meet them. And I have eight new friends as well. What a great panel--professionalism, thoughtful conversations." Her fellow panelists at Wi14 included Erin Ball of Third Place Books, Lake Forest Park, Wash.; Lori Feathers of Interabang Books, Dallas, Tex. ; Grace Harper, Mac's Backs, Cleveland Heights, Ohio; Brian Lampkin of Scuppernong Books, Greensboro, N.C.; Myles Mickle of Village Square Booksellers, Bellows Falls, Vt.; Julie Slavinsky of Warwick's, La Jolla, Calif.; and Emilie Sommer of East City Bookshop, Washington, D.C. Panel member Pam Sterling of East Bay Booksellers, Oakland, Calif., was not at Wi14. Madhuri Vijay (The Far Field, Grove Press): "I have the chance to say this to all of you at once. Thank you so much for all that you do. Thank you to the panel for reading with such care and for supporting all of us. Thank you." 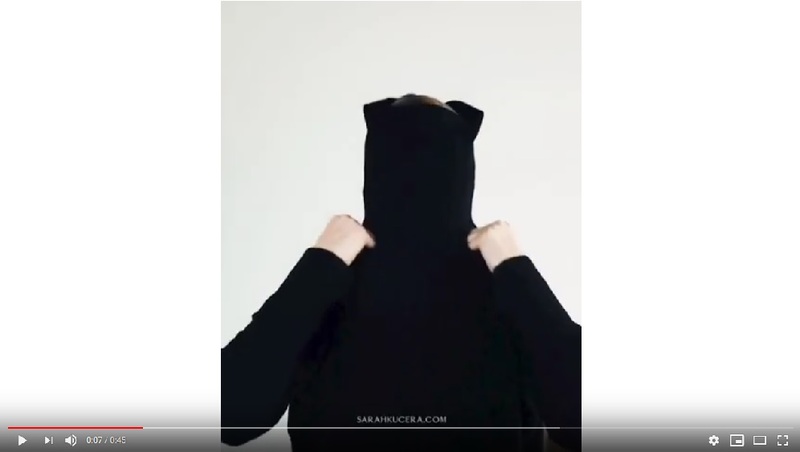 Dana Czapnik (The Falconer, Atria): "I also want to thank everyone who was a part of choosing our books and for being incredibly, incredibly supportive booksellers. I greatly greatly appreciate it." Justin A. Reynolds (Opposite of Always, Katherine Tegen Books): "I just want to say thank you to all of you. I have two daughters and I can't imagine living in a community that didn't support independent bookstores. So thank you for all that you do." Candice Carty-Williams (Queenie, Scout Press/Gallery): "I've been able to thank some of you though not all of you because of time and possibility. But I'd like to thank you all now." Laurie Brown died peacefully yesterday at her home in Wilton, Conn., after a prolonged battle with cancer. In her final weeks, she was surrounded by family and friends and her beloved golden retrievers. She was 69. Her career in bookselling and publishing touched many lives. 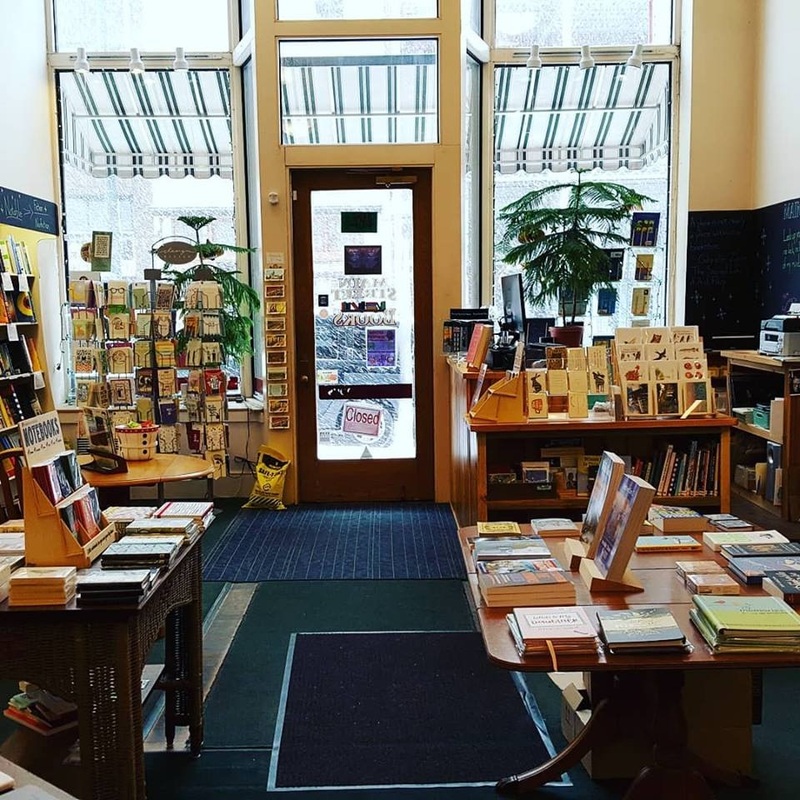 With humble beginnings at the Remarkable Bookshop in Westport, Conn., her intelligence and instincts quickly became apparent to many throughout the industry. Her career spanned nearly 40 years, including stops in various sales, marketing and publishing capacities at almost every major publishing house, including Time Warner, Random House, Simon & Schuster, Farrar, Straus & Giroux and Houghton Mifflin Harcourt. Publishing and bookselling were Laurie's life. While a voracious reader and well recognized for her publishing instincts, she will most of all be remembered for her incredible thoughtfulness, kindness and heart. 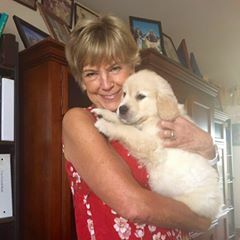 Among her survivors are her sister Lynn Cully, v-p, publisher of Kensington Publishing, and brother-in-law David Cully, president of Baker & Taylor. Gregg Hurwitz (left) celebrated the launch of his fourth Orphan X thriller, Out of the Dark (Minotaur), at Diesel, a Bookstore, in Brentwood, Calif. 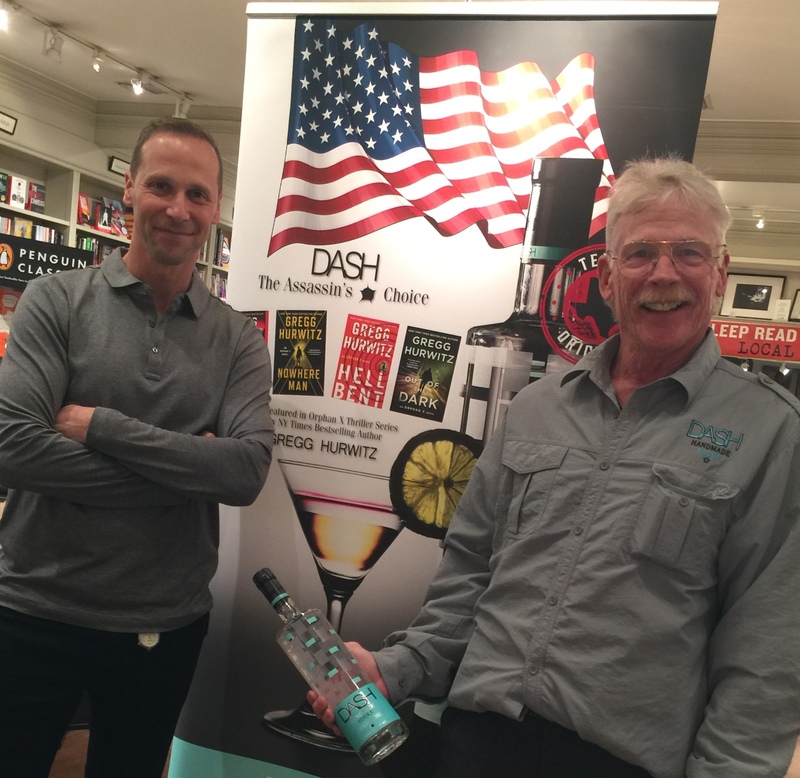 The event was sponsored by Dash Vodka, one of Orphan X's favorite vodkas. Hurwitz is pictured here with Hank Reeves, v-p of sales and marketing. 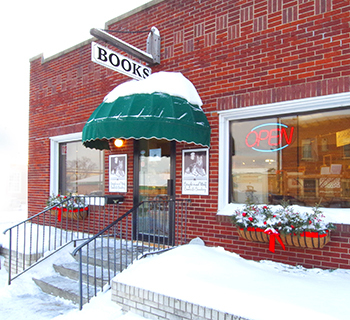 A tip of the fur hat to Beagle and Wolf Books & Bindery, Park Rapids, Minn., which has stayed open all week despite polar vortex temperatures that on Wednesday hit -42 with a wind chill of -64. The store reported that "there's been some walk-in traffic and a number of phone orders." Owner Sally Wizik Wills said, "It's been a great time to catch up on things!" Posted by Main Street Books, Mansfield, Ohio: "Lovely to be in a thoroughly cleaned, counted and straightened store on this snowy day. And lovely to have inventory behind us as well!" 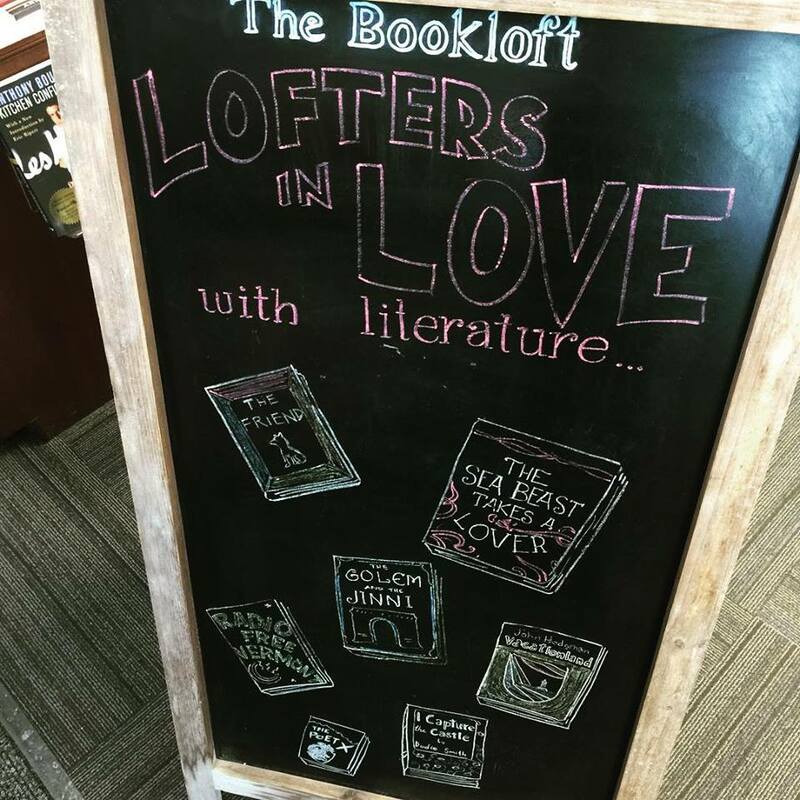 The Bookloft, Great Barrington, Mass., shared photos of its latest sidewalk chalkboard creation on Facebook, noting: "Channeling our inner @jane_mount for February's 'Lofters in Love' chalkboard sign... Swipe for close-ups of each bookseller's favorite literary loves." The Ayurvedic Self-Care Handbook: Holistic Healing Rituals for Every Day and Season by Dr. Suhas Kshirsagar and Sarah Kucera (The Experiment). Old Baggage, the novel by Lissa Evans, is being developed into a TV series by George & George, the production company run by Joanna Scanlan and Vicki Pepperdine, with Alan Partridge producer Baby Cow, in association with U.S. producer Braven Films, Deadline reported. "Lissa's grasp of character and her immaculate feel for women's history made this property irresistible to us as actors and now producers," said Scanlan and Pepperdine. "The book made us laugh, it made us cry and it kept us up reading till three in the morning. We can't wait to start to develop it for long form television." Executive producer Frida Torresblanco of Braven Films said, "Old Baggage is another brilliant work from Lissa Evans, she surprises us again with a transcendent work of extreme timeliness. I'm so inspired to be working again with her on this prequel to the equally defiant Crooked Heart. This is a deeply evocative dynamic story. Her fun brave women are the authentic origin of the social changes that we relive these days." Mesha Maren's short stories and essays have appeared in Tin House, Oxford American, Crazyhorse, Southern Cultures, Hobart, Forty Stories: New Writing from Harper Perennial and elsewhere. 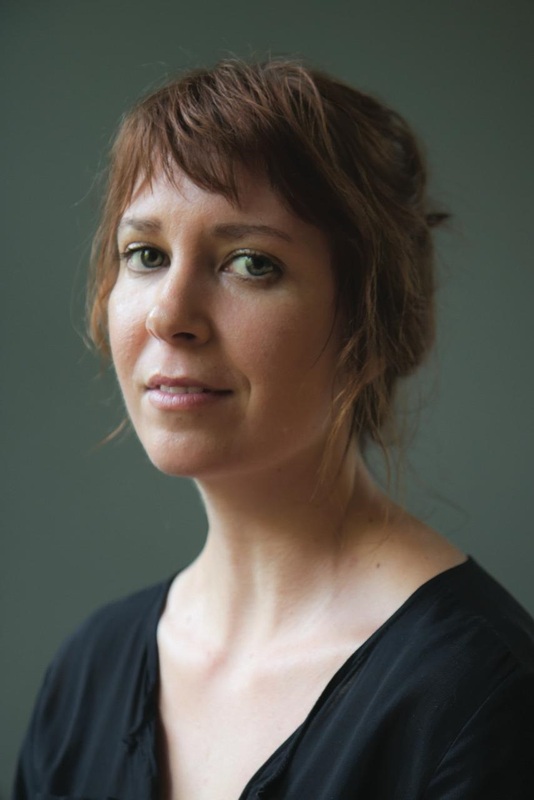 She is the recipient of the 2015 Thomas Wolfe Fiction Prize, a 2014 Elizabeth George Foundation grant, an Appalachian Writing Fellowship from Lincoln Memorial University and fellowships from the MacDowell Colony and the Ucross Foundation. She is the 2018-2019 Kenan Visiting Writer at the University of North Carolina at Chapel Hill and also serves as a National Endowment of the Arts Writing Fellow at the Beckley Federal Correctional Institution. 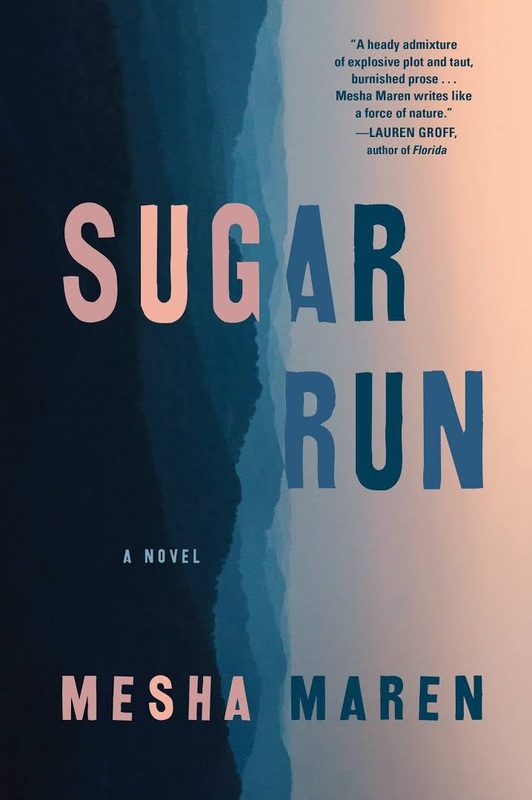 Sugar Run (Algonquin Books, January 8, 2019) is her debut novel. Waiting for Nothing by Tom Kromer--an amazing autobiographical novel written by a man from Huntington, W.Va., about his years of homelessness during the 1930s. Lost Highway: Journeys and Arrivals of American Musicians by Peter Guralnick--an exploration of early country, rockabilly and the blues music. I found a copy of Edith Hamilton's Mythology in the library when I was probably about nine and I became obsessed with it. I grew up way out in the country and we didn't have a TV, so I invented ways to entertain myself. One of those was to make my own audiobooks. My parents had given my sister a little pink boombox and I would borrow it and record myself reading my favorite books: Hamilton's Mythology, Joel Chandler Harris's Brer Rabbit Stories, Forrest Carter's The Education of Little Tree. I still have a few of those cassette tapes and the funny thing is that I had no idea how to pronounce the Greek names in Mythology but that didn't stop me. I mangled the names and kept right on going. I also became deeply obsessed with Alfred, Lord Tennyson's poem "The Lady of Shalott" when I was 12. I memorized the whole poem and performed it at my elementary school talent show. It didn't quite have the effect that I had anticipated: I don't think anyone knew what to make of a gangly girl in an old wedding dress reciting Victorian poetry. Anne Carson, Mary Gaitskill, James Baldwin, Denis Johnson, Robert Stone, Larry Brown, Joan Didion, Pete Dexter. I've never faked reading any book. I have a ton of experience with faking like I've watched TV shows and movies, though. I grew up without a TV at home so I spent years stealthily navigating conversations while trying not to admit that I had seen almost no movies or TV shows. Juliet the Maniac by Juliet Escoria--an explosive portrayal of teenage life, mental illness and self-destruction (coming in May 2019). Meander Belt: Family, Loss, and Coming of Age in the Working-Class South by M. Randal O'Wain--a collection of gorgeous, whip-smart essays (October 2019). I'm also always telling people that they have to read The Sarah Book by Scott McClanahan and Virgin and Other Stories by April Ayers Lawson. Fat City by Leonard Gardner and Hard Rain Falling by Don Carpenter. Gardner and Carpenter were the first two NYRB Classics that I bought, and they are two of the best books I've read over the past five years. All of the NYRB Classics covers are f*cking gorgeous--In the Café of Lost Youth, The Seven Madmen, Life and Fate. Rubyfruit Jungle by Rita Mae Brown. I hid it under my mattress because I felt sure that if my parents so much as caught sight of the book they would somehow automatically know that I had masturbated to passages from it. Written on the Body by Jeannette Winterson and Cavedweller by Dorothy Allison. It was after reading Winterson's novel that I finally got the guts to come out to my family. And Allison's novel was important because it was the first time I saw rural lesbian characters--queer women who didn't live in cities and go to gay bars but instead went spelunking and worked at country gas stations. The Bible, King James Version. 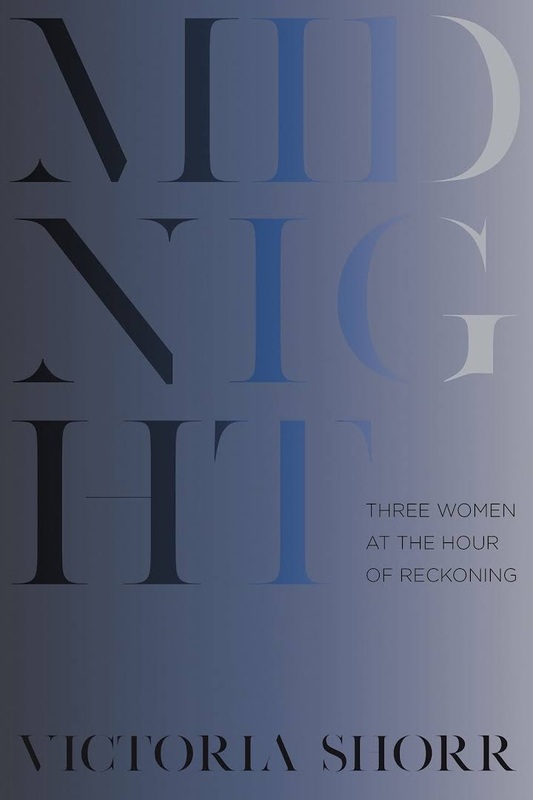 In Midnight: Three Women at the Hour of Reckoning, Victoria Shorr's (Backlands) remarkable literary voice illuminates the lives of three famous women. Jane Austen, Mary Shelley and Joan of Arc are each seen standing at respective thresholds in these well-researched fictionalizations, their extraordinary lives given immediacy and power and even--despite what we already know--suspense. At 27, Jane Austen is practically an old maid by her society's standards. Along with her unmarried sister and parents (who have given up home and livelihood for one of their sons), Jane travels from one relative's home to another, essentially homeless, and without hope of the one salvation expected for a woman of her class: marriage. Her witty writings have entertained only her immediate family. And then, a near miracle: the younger brother of dear friends proposes. Jane agonizes through the night, but decides she cannot marry for less than love, like the best of her heroines. Instead she carries on a life of privation, quiet embarrassments and the masterful writing of the classics we love her for today. Mary Wollstonecraft Godwin was 16 when she met Percy Bysshe Shelley on a street corner at 4 a.m., to run away to a life of adventure and art and pain. We meet her on a beach at 24, after the deaths of two children, pacing the shore where Shelley has sailed away. He was due back days ago, and now Mary reviews her choices. Might she have been happy if she'd never met Shelley? Readers find Joan of Arc on the platform beneath the stake where she is to be burned, in the moment when terror strikes her and she renounces her saints and her cause, hoping to avoid death. Over the next week in prison, she relives her triumphs and her faith, then dies at the stake after all. It is a brief interlude in her life, but an enormous one for the reader, who feels in this extended flashback all the intensity she's lived. Would her life have been better if she had stayed home to mind her sheep in Lorraine? If she'd turned back from Reims, and not pushed, prideful, for Paris? Shorr sets up an interesting interplay between Joan of Arc, the confident hero, and Girl X, as the woman who renounced her beliefs on the platform thinks of herself. The dialogue between the two carries on until the end, when Joan burns. Shelf Talker: Well-researched and perceptive, this is a gripping triptych that explores the inner lives of Jane Austen, Mary Shelley and Joan of Arc. In our story yesterday about Las Vegas's Writer's Block reopening soon, we quoted the local paper's comment that the store will stock a million titles. The Review-Journal--and we--were off by approximately 982,000 titles, since the store actually will stock 18,000 titles. Our apologies for relaying the mistake. To open the Wi14 session "Selling International and Diverse Books: Panel with Bookselling Without Borders Alumni & Organizers," Michael Reynolds of Europa Publications said that publishers of international books want their titles to be more visible in the market, and "we understand that booksellers are an absolutely vital link to make that happen. We want you to be better informed, better connected, more involved in the international book scene; we want to expose you to the sophistication of international publishing. And in this way hopefully you become more effective advocates for our books." Bookselling Without Borders now comprises a group of 14 independent publishers, "all of them committed to international works of fiction and nonfiction, all kinds of different publishing programs," Reynolds said, adding that this year the program is organizing fellowships to five different book fairs in Frankfurt, Istanbul, Bologna, Turin and Guadalajara, as well as a residency for the first time in India. While acknowledging that publisher sponsors may have their own goals for participating in BWB, Christie Henry of Princeton University Press sees this "as part of a much larger initiative to share knowledge and build partnerships and pathways for collaboration.... I think ecosystems, in order to thrive, there needs to be a really routine flow of nutrients and in our ecosystem those nutrients take the form of books, but they also take the form of knowledge. 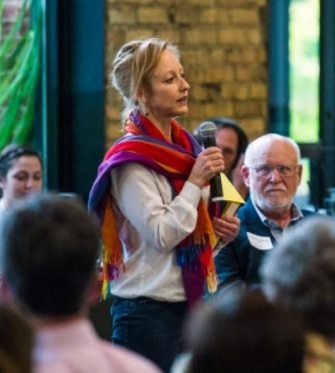 And I think BWB provides some excellent new pathways for that nutrient flow and will be really essential to our future resilience and ongoing evolution." Two years ago, David Sandberg of Porter Square Books, Cambridge, Mass., attended the Turin Book Fair on a BWB fellowship in the wake of Roxanne Gay's Wi12 keynote, during which she "completely challenged us to say you can't just say that stuff is happening to you. You have to take risks. What are you going to do about it?... And then this opportunity came up and one of the things that was fairly obvious that we could do as booksellers is talk about certain types of books that are more diverse in viewpoint than what we were used to selling and our customers were used to buying.... For me, that trip to Turin came at the perfect time because it was a logical answer to that question of what can we do differently.... It lived up to all my expectations in terms of the extent to which I could come back and not only know about specific individual books and authors, but really be able to think differently about a whole type of literature that I always knew existed but never thought of consciously as something that, in and of itself, was important to promote." Anna Thorn, formerly of Busboys and Poets, Washington, D.C., now runs Bookstore Vagabond and is the new BWB program coordinator. 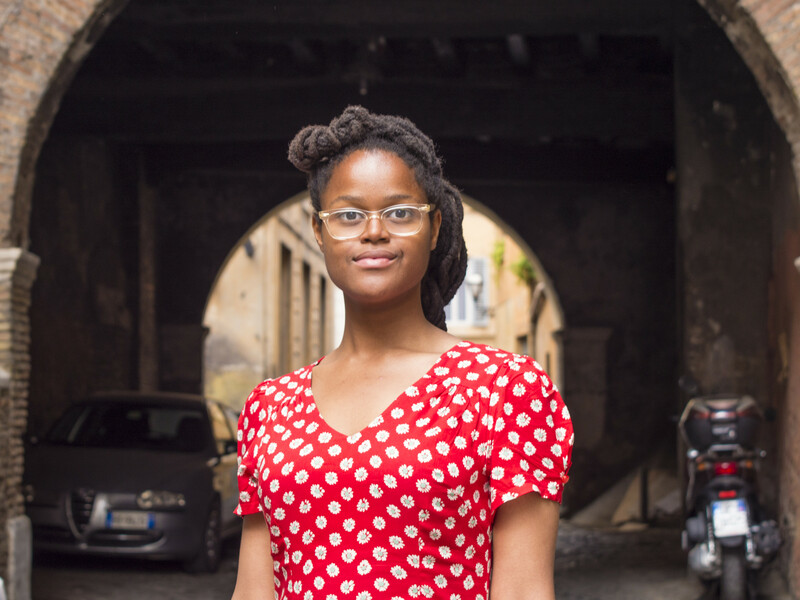 One of the highlights of her 2018 Turin Book Fair fellowship was the opportunity to share the experience with three other booksellers: "The days were packed and long and we would come home late, and all we wanted to do was to keep talking about everything we were thinking and learning about.... Having those three other brilliant booksellers from different stores across the country and from different perspectives, different roles; having them to constantly give ideas to and hear what they were getting from the experience was huge... and also made me very close with them, which is great for building up a network back home. You can ask questions, you can talk about what you're doing in your stores moving forward to keep the momentum going." Describing her fellowship at last year's Frankfurt Book Fair as "an amazing experience," Lyn Roberts of Square Books in Oxford, Miss., said, "It changed me and how I sell books and how I view bookselling, but it's very difficult to quantify it. Someone asked on a form what percentage more international books are you selling now, and I don't know. But I do know that we talk about it more and I have more of an appreciation for books internationally and also for this global community of bookselling and the book industry.... We're part of something that's really grand and wonderful and can change the world. People ask about why did you want to do this, and I'm like,'world peace,' which is a very simplistic answer, but I believe in conversations." Stephanie Beddingfield of Inkwood Books, Tampa, Fla., who attended the 2018 Guadalajara Book Fair, said, "I think just going into this festival and just seeing the countries represented and how many books; it's very humbling. You realize how much you actually don't know at all. The beautiful children's books, illustrators.... But I think that the best thing about it is talking to the other booksellers and sharing information, and talking to other publishers." When Reynolds asked what they had "brought back" from their BWB experience, Thorn noted: "It only takes one person at a bookstore to really change how a certain genre is sold. You know from eavesdropping on the handselling of all of your co-workers. It has a ripple effect throughout the store. And that was already very visible."